No offense intended to Alaska. I lived there for a year courtesy of the United States Air Force, (I have even stopped for gas in Wasilla on the way up the Alaska highway to Fairbanks.) I have family members who live there and love the state. They report that their governor is popular two years into her term, partly because she “stands up” to powerful oil barons and is highly critical of her own state party’s reputation for corruption, for which senior Senator Ted Stevens, now on trial in a federal court, is a poster boy. Of course, to get elected, Palin did rely on an endorsement from Stevens with an ad that has quickly disappeared from her website. Fortunately, Talking Points Memo saved a copy of the ad. There are other states with female politicians who are well liked and have been at the job for much longer than Palin. So why Palin? It had nothing to do with winning Alaska’s three electoral votes. It had nothing to do with experience or having someone ready to take over from Day One should the 72-year-old president with a history of cancer not survive his first term. The first important decision McCain made was a shock to the Republican establishment which was gearing up to slam Obama’s lack of experiene. Ever the maverick, McCain plowed ahead with a decision designed to soften the ticket’s image with a new fresh face, freeing his campaign’s darker forces to conduct the usual Republican smear campaign. For reasons related to the media’s fondness for a pretty face, Sarah Palin will be a household name a lot faster than any of the male options McCain might have picked from what is admittedly a weak Republican minor league system. The real John McCain is not interested in that system. He got where he is today not through the party but by performing as a genial maverick. McCain has been smeared in the past by the Bush machine. Now, like an abused child he is ready to be the abusive parent. Sarah Palin arrives, truly out of nowhere, just in time to provide the genial maverick with a charming, and it must be said, attractive female partner with a record so brief she could have been a What’s My Line? contestant. Before Palin was chosen, Joe Klein wrote a prescient Newsweek column that traces the symbiosis between the most recent Republican attack dog consultants, Lee Atwater (who orchestrated Bush One’s smear machine against Michael Dukakis) and his protege, Karl Rove (dirt-master for Bush Two, first against McCain and then John Kerry). Karl Rove is not officially on the 2008 McCain team but as The Command TOC reminds us, he remains near at hand. He disdains all those–his colleagues in the Senate, his political opponents–who aren’t as courageous as he thinks he is. But McCain has proved a selective maverick, surrounded by special interest lobbyists who shape his foreign and fiscal policies. In fact, I suspect that this year’s McCain is closer to the real thing than the noble 2000 version. This one is congenitally dark, the opposite of Reagan–not confident enough in the substance of his ideas, especially on domestic policy, to run a campaign that features them. Instead, his natural sarcasm has enabled him to perfect the Bush way of politics. . .
Was it that sarcastic nature that convinced McCain that the governor of Alaska, in office less than two years, and former mayor of Wasilla, was his best option as vice president? Of course not, which places her in the same role as Clarence Thomas when Bush One called him the best qualified African American candidate for a Supreme Court judge. So why pick this nice (and yes, attractive) 44 year old governor with a very slim resume, to fill the number two slot? The answer is easy. She was what Karl Rove needed as a soft front behind which he could operate his smear machine against Barack Obama. The former mayor of a suburb of Anchorage, Alaska (population around 6,000), is already being spun by the Republicans: She is pro life, belongs to the NRA, hunts and fishes for real, not just for political photos, belongs to a nondenominational evangelical church, i.e., not one of those liberal mainline denominational churches. She eats mooseburgers, and is the mother of five, the oldest of whom will soon be deployed to Iraq. In 1984 she was runner-up in the Miss Alaska contest. A nice hockey mom like this would certainly have no part in smearing a political opponent. Would she? “The Headless McCain Smear”, a column Glenn Greenwald wrote for Salon on January 21, 2008, makes a convincing case that the McCain smears in the Republican primary in 2000 were never actually traced to Bush Two, in spite of the reality that Karl Rove’s fingerprints were obvious to anyone paying attention. A couple of weeks ago, I began noticing in passing that John-McCain-loving journalists loved to highlight in the most melodramatic terms possible the horrendous, ugly, vicious “smear campaign” which victimized McCain in South Carolina in 2000. Yet as they harped on how terrible, mean-spirited and even overtly racist it all was, none of them ever said who was responsible for any of it. In their narrative, McCain was the sympathetic victim — that was always clear — but every time they described it, they would strain to use the passive voice, so as to avoid any mention of who the culprit of the “smear campaign” actually was (as in: “In 2000, McCain was the target of an ugly smear campaign in South Carolina suggesting he had an out-of-wedlock black daughter and that he suffered from mental problems due to his POW years, etc.”). . . . The reason for this gaping omission — search high and low and see if you can find any reference to the perpetrators of the Smear — seems rather clear. McCain only had one opponent back then — the Honorable, Ethical George W. Bush, who restored adult honor and integrity to the White House. And his campaign was run by Karl Rove, perhaps the only national political figure who can compete with McCain when it comes to the media’s swooning affection. Honorable and decent men like that can’t possibly have been involved in something so wretched. In the 2000 South Carolina primary, one of the most notorious smear campaigns in recent American politics peddled distortions and lies about him, among them that Mr. McCain’s current wife, Cindy, was a drug addict and that the couple’s daughter Bridget, adopted from Mother Teresa’s orphanage in Bangladesh, was a black child Mr. McCain had fathered out of wedlock. (January 17, 2008). McCain needs a cover for what he plans to do to Obama, not on policy issues, but on Bill Ayers, Jerimiah Wright, and some false dark hints of Islamic connections. McCain knows the best smear is the smear that floats headlessly among voters more interested in American Idol and Dancing with the Stars than they are in politics. And while he knows nothing about the internet, he does know the headless smear is what protects the candidate from looking mean and dirty. Rove’s involvement in this decision emerged several days before the announcement when a report surfaced that Rove had told Lieberman to withdraw his name from consideration, a request Lieberman refused. Rove knows his public and he felt Palin could be the key to the Hillary voters, wounded women whose passion for their candidate had, in their judgment, been disdained by the media. Rove was also able to assure McCain that conservative talk radio, Fox News, CNN, and The Obama Nation crowd will circulate this year’s version of Swift Boats and Willie Horton. Chicago conservative radio talk show host Milt Rosenberg has already weighed in with two hours of conversation with Stanley Kurtz of the conservative Ethics and Public Policy Center, promoting the story that Obama and Bill Ayers have been close buddies for decades. Not true, but Kurtz got two hours on a major midwestern radio station to peddle the tale. Ayers and Obama served on a board together some years back. Ayers’ radical past is well behind him, and he now makes a significant contribution to education in the city. But from behind the scenes, with help from media outlets like Chicago’s WGN, the campaign will continue to make Ayers a negative character witness against Obama. So can we connect the smear campaigns of the McCain Rovian forces to McCain’s choice of Sarah Palin as his running mate? Absolutely and here’s how: McCain really wanted Joe Lieberman, his close buddy. But the convention would have rejected a pro-choice selection. Nor would Lieberman have provided cover to the genial McCain; softness is not his strong suit, slickness is. So why Palin? The answer is Obama’s selection of Joe Biden, a proven campaigner, and an experienced foreign policy hand. The Biden selection took the experience card “off the table”. Even worse for the Democrats, it put Biden in a bind in confronting the uninformed nice lady from Wasilla. 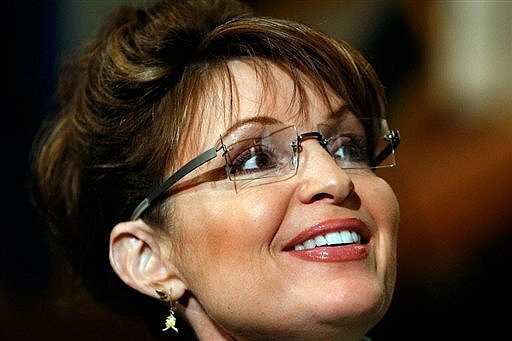 Sarah Palin softens the McCain image. It may look like a foolish choice to the Democrats, but it could be a winning choice for John McCain, the candidate who has turned his campaign over to the same dark forces that smeared him in 2000. His Rovian forces are now free to play the fear-mongering Bill Ayers-Reverend Wright smear card against Obama. Get ready for all those emails from your Aunt Susie warning you about the danger of putting a radical Black Muslim in the White House. Tell her that is a lie, that Obama admires Islam, but that he is an African American Christian, as are his wife and children. But, just you wait, she will tell you McCain and that nice hockey mom would never tell lies. I believe in Americans. We are not fools. Stand up and say no to the McCain smear campaign. NO – we will NOT be lied to. NO – we will not have the wool pulled over our eyes. NO- we will NOT BE DISTRACTED FROM THE ISSUES. Give us what we are worthy of. Truth about the economy. TRUTH about the direction of the war in the Middle East and how we can win. Obama says it’s in Afganistan. What do you say McCain? We have heard Obama’s plan. What is your’s???? No One is fooled by Karl Rove, Sarah Palin or McCain. Their time is over and they know it. No one trusts them even they did tell the truth no one will ever believe them. They have no policy other that hate.